A screenshot of the \Trash app! We wanted to learn about databases while simultaneously helping our community. 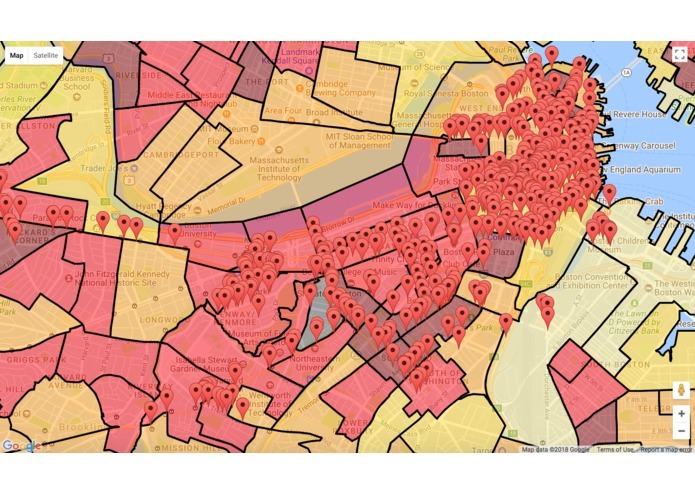 By comparing the locations of existing trash cans to population density across Boston, Backslash Trash makes it easy to visualize places where new trash cans are most needed. Aside from Python, all of the APIs and programming languages we used were completely new to us. Extracting data from large sets was definitely challenging, as was familiarizing ourselves with the GoogleMaps API. However, our biggest struggle was deducing how to overlay and color-code the population density heat map. We sought help from the SheHacks mentors to set feasible goals to keep us on track towards realizing our final product. We are extremely proud of the finished product as a whole, especially when we think about how much we have learned just in the course of this weekend. More specifically, seeing our data visuals appear on the GoogleMap for the first time was so rewarding. These breakthroughs gave us the confidence to keep coding, even though we often were working with applications that were completely new to us. We have many ideas for how to move forward with /Trash. One of the great things about our project is that it is scalable and could easily be implemented in other cities around the world. Given more time, we would host our application on a server so that it can be accessed remotely. Additionally, we would like to continue to add overlays to the app such as urban development, economic growth, and traffic statistics in order to consider more factors when choosing where to place new trash cans. We are happy with what we have produced, but we acknowledge that there's much more we **CAN** do with /Trash.